These plans can be used to make a lawn swing for the yard or hang it from the porch as a porch swing. Click here for detailed lawn/porch swing plans 1. 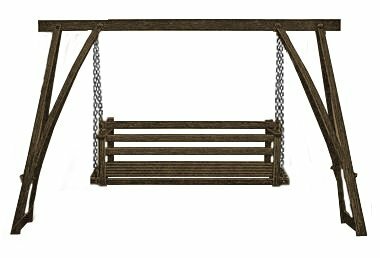 While this lawn swing is substantial and rigid it can be moved from place to place on the lawn, or the chains can be fastened with heavy hooks to the ceiling of a porch instead of using the stand. Either ropes or chains may be used to hang the swing and should be of such length that the seat will be about 20 in. from the ground or floor. The drawing giving the dimensions for constructing the seat shows how the parts are put together. The front and back apron pieces are mortised to receive a 1-in. square tenon cut on the crosspieces that support the slats. Each end of the apron pieces extends 4 in., and a hole is bored at A into which the hanging ropes or chains are fastened. If ropes are used, bore the holes to fit the rope and when the end of each rope is put through a hole it is tied in a knot to keep from slipping out. Chains can be fastened with eye bolts. Small carriage or stove bolts are used to hold the slats on the framework and cross pieces. The arm rests are fastened with wood screws. The drawing for the stand gives all the dimensions for its construction. Split the upright pieces or legs with a saw cut to the length as shown. A bolt should be put through each piece edgewise at the end of the saw cut, to keep the wood from splitting any farther when the ends are spread to receive the bolts through the cross pieces at the top. The upper ends of the ropes or chains are fastened close to and under the bolt holding the inside forks of the uprights. This bolt can be long enough to fasten a clevis that will hang underneath for this purpose. The whole swing can be painted with a forest green color which is very suitable for summer outdoor furniture.